Welcome to the haunted hovels section of Haunted places in Vermont. Please select a link below to view information on that location. Please note that this section is always growing and new locations will be added when time permits, so please check back if you don't find what your looking for. Alternatively, if you know of a haunted location that isn't in the list, then feel free to send me a message in the contact section and I'll will make it a priority to cover it for you. But for now, please enjoy what's here. Located on Mount Anthony, this college campus has boasted great photo graphic evidence of supernatural images. The seminary closed and became the co-ed college that it is now. According to years of students and staff alike doing night security, the reports of who haunts the house say the second wife, who is commonly seen, Everett himself, he is rarely seen though, and also a person in a black hooded robe, who has been the most commonly seen apparition. The most common occurrence's are smoke filled hallways, lights that turn on in room's that are locked, doors and windows unlocked after being locked on a previous security round, footsteps are heard all around the college when no one else is in the building. The two main haunts in this mansion is the third floor, the abbey room is burning with energy, and a classroom, that used to be the sleeping quarters for house staff, and is also where a maid is said to have hung herself. The town of West Castleton has been long abandoned, but once it was called home by Irish immigrant slate workers who were fond of crossing Lake Bomoseen to a tavern on the east shore. One night, three men set out for a night of revelling. They never returned. The next morning, their boat was found floating empty. Their bodies were never found. Today, lakeside residents claim that sometimes during a full moon, an unfamiliar ghostly rowboat can be seen moving silently across the lake toward the West Castleton Bay. There are no oars disturbing the otherwise glassy surface of the lake. A former security guard for this school reports hearing their name being called when there was definitely no one else around. Other members of staff also say that they have heard their name in the exact same spot, all happening on seperate occasions. Also there have been lots of strange noises, lots of movement passing out of the corner of your eye only to have nothing there when looked at further, lights turning on by themselves, a sense that you are being followed, and reflections in television screens, only, when you turn around, nothing is there. There does not appear to be anything malevolent in these apperances, they are just eerie. Several members of staff have described hearing voices coming from above the dining area of the country club. None of the waitresses like to close up alone. There are also reports of footsteps walking overhead and other various sounds. No one claims to have any idea of who the ghost or ghosts are. A man who used to work in this establishment is said to have killed himself in the basement. Reports say that he shot himself and the bullet went through his head and into the wall. There is still evidence of the bullet hole in the basement wall. Most of the encounters happen in the basement, which also houses the kitchen and the kegs under the bar. Waitresses have reported their skirts being lifted up by a cold wind. Doors always seem to slam closed, some of the waitresses have even been trapped in the basement's walk-in fridge. Due to the obvious fixation on females, the waitresses have been told not to go down into the basement at all. The basement is also connected to some of the other old buildings in downtown Burlington by various tunnels from the prohibition era. There are a many reports of hearing people talking throughout the restaurant when no one is there. The ghost seems to mess mostly with women. There has been a lot of breaking glasses, plates flying off the counters and sudden increased oven temperature's too. One of the bartenders, who also happens to be female, reported a pyramid of water glasses appearing on the bar, just after she had put the glasses away and had only turned her back for a second. Throughout the whole dormitory there is a common uneasy feeling between the students. In an upstairs bedroom noises have been heard and the television has randomly turned off on it's own accord. A few people have been touched by the spirit, one girl felt someone playing with her hair, while another felt hands on her shoulders. Cold spots are common. Noises throughout the dormitories have kept students awake at night. The former director reports seeing the ghost of 'Captain Jacobs', a retired seaman who died there in the early part of the 20th century. There has also been mild poltergeist activity reported. This hall is believed to be haunted by a former student who had committed suicide there. Though no one has ever seen this spirit, he has been known to turn radio's on and off and he also interacts with electrical equipment. The student is thought to have electrocuted himself in 1998. This dormitory has an intermittent ghost that appears on the back staircase and has been seen to run through walls. He does not appear to be fond of female students for some reason, the common belief is that this is pertaining to the circumstances of his death, and on a few occasions he has chased people out of the area. 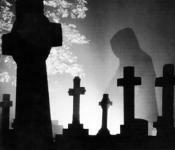 There is thought to be a spirit of a man who stalked a girl and followed her to her dorm one year. He now resides in Simpson Hall. Late at night students wake up with a sense that they are being watched, usually the room becomes icy cold when this happens. It is very rare but on occasions some students have woken up freezing at night, with the feeling that there is someone else in there bed with them. Ellis Hall has been part of Castleton State College campus for years. On the second floor in this building a female student killed herself and now students can hear her flushing toilets, running showers and also the taps in the toilets. It is widely believed that almost every building on the campus is Haunted. This farmhouse in Cavendish, was built by Deacon Jonathon Wheelock in 1789, when he founded the first Episcopalian church there. Sadly he fell victim to a violent accident that took his life. Every now and again there are encounters of classic poltergeist activity such as things not where they were left, including being moved to a different room when no-one else was in the building and things falling off shelves etc, this eventually gave over to sightings. On rare occasions, witnesses have woken up to see a bluish form, in a vaguely human-shape, either looking at them or out of the window of the rooms, this seems to change depending on who was encountering the ghost at the time. There are a couple of places on the campus that seem to have ghostly visitors. The first being the theater that is supposedly haunted by a nun who assists the actors. There have also been incidents reported during performances of props disappearing with no explanation. The second being the men's first year dormitory seems to house an evil presence. It is believed that in the 1960's or 1970's, a group of young men were holding some sort of occult meetings. One of the men insisted that he needed to close the 'portal' before they left, but by that time the security had arrived and they were thrown off campus. The door to the attic is padlocked shut. However, lights go on in the attic and footsteps are heard in the middle of the night by the residents on the top floor. The image of the pentagram still exists on the floor despite attempts to replace the wood. A ghost appears to reside in the manner house here. The best evidence of this is when a perspective student walked into the manner to find a man who was playing the piano. The student asked the man for directions and he just continued to play she walked out frustrated and was heading into the upper garden when she turned around and the piano player was demonically laughing at her and then vanished into thin air, the same sort of thing has also happened to many of the students. The whole campus has strange happenings all over. During the late 1800's, a fire occurred on the original railroad trestle. A train with passenger cars was involved and eight people died, including a young boy and his father. The old wooden bridge has since been replaced with a steel structure on the original concrete footings. The bridge spans the White River and Route 14 in West Hartford. There have been numerous sightings of a little boy ghost playing in the river, and many people have even reported smelling fire in the area of the old bridge. For nearly a century there have been reports of logger ghosts as they float down the Connecticut River near Sumner Falls. There are also reports of a tall phantom dressed in black wearing a black hat, that has been spotted on the nearby trails. Sightings of people have been witnessed throughout the school. In the windows you can see people watching you. The old tower is known to be the most haunted area of the building. The bell in the tower has been heard by many people, ringing. Care takers have heard footsteps traveling through the halls, the faint laughter of children, doors shutting, and also the temperature dropping. A man was building a nursing home for his sick mother and before it was finished she passed away. He sold it to aspen and it is now a boarding school. the girls have reported strange occurrences including seeing a little boy running up and down the hallways turning lights on and off, a pregnant woman has been seen in the dormitories and strange occurrences with the air-conditioning, some reports of possession have also arisen. This chapel was built in the 1830's. In the late 1800's, a girl died in one of the towers. A security guard was taking a group of students up to the tower and one of the girls felt the left side of her body go numb. They found out later that the autopsy of the girl whom was murdered, the left side of her body also went numb because of getting shot behind her left ear. When you walk through the building, you can feel someone blowing behind your head. The pipe organ has also played three chords on its own when it was turned off. Chaplin Hall is haunted by an unknown spirit who is visible at night by the front door. When the building was used as a library, books regularly floated off shelves and strange voices were heard when no one was there. Several of the cadets have reported that during the night they wake from a sound sleep unable to move, screaming and finding it very difficult to breathe. There are many stories of room twenty being haunted by the ghost of a woman who died in the room. She is also known for her occasional appearances in the dining room. She walks through the room wearing a dark formal dress, without disturbing any of the customers. Many years ago, the Vermont Police Academy was a state hospital for Tuberculosis patients. The academy, to this day, is haunted by a nurse who worked at the hospital and while there, contracted the disease herself. All of the old call buttons are still in the recruits' rooms, and it is said that if pushed, the friendly ghost of the nurse, Mary, will pay a visit during the night. When Rutland High School was first being built there was a man who operated the cement mixer. He was called Smokey because he smoked around 6 packs a day. One day he disappeared. The foreman thought he just took off and didn't give it a second thought. Once the school opened girls started smelling smoke in the girls locker room. At first everyone thought that some one was smoking before gym class. The female gym teacher then stood guard to catch anyone smoking. She never caught anyone but the smoke smell is always there. This building is thought to be haunted by an executive that went to the third floor, and shot himself in the head. Lights will turn on and off during the night on the third floor, and there is no way to get in there unless you have a ladder and some tools, as it has been closed off. The house was owned by a man and his family. The family all passed away. The house is now used as a home for the elderly. People who live there say that they have heard glass breaking but when they look nothing is broken. They have also seen a young girl who wears a red dress and walks about and is friendly with the residents. Wake Robin is a nursing home, and in room 229 there is a ghost, thought to be that of the woman who used to stay in the room. Before she died, she told the nurses that she would come back to haunt them. She said that she would ring the bell and haunt them. There are also two more down stairs. They are a couple who occasionally hit the call button for the lift and run up and down the hallways. In 1903 construction of the Hartness mansion began, by 1904 it was complete. There are a series of rooms under the front lawn that James Hartness had built specifically to escape the noise every day life. In the main house the electricity randomly turns off for no obvious technical reason, it usually lasts for roughly an hour or two. Objects go missing to be placed some where else, in the basement, a favourite area is the housekeeping quarters, you can feel a presence watching you, it is nothing malevolent just there simply to observe. This old schoolhouse was built before the turn of the century. It was even used as the St. Albans Haunted House Halloween Event from 1979 to 1989. During the 1920's, a care taker died from a heart attack in a girl's toilets, located in the cellar. Cold spots and odd sensations have occurred here, as well as an apparition appearing in a window in the south wing upstairs. That particular window refuses to remain closed even after attempts to nail it shut. Sounds of footsteps have also been heard in that location as well as lights turning on and off. People have even reported hearing strange dismembered voices. This used to be a prison and now stands as a movie theater that has had several occurences. Several times the projection booths have been a spot of questioning. Movies have started by themselves and voices have been heard in the old booths. The basement, which still has the remains of old jail cells, has the feeling of being watched. An old man with a white sweater has been seen walking around the basement. He is said to be an old homeless person who years ago moved into the basement and lived there. The basement door also has been know to fly open even when latched. Doors that say alarm will sound when opened have opened with out the alarm going off. Overall the theater has a very uneasy feeling to it. There have been several sightings of a ghost ship floating about in this bay. Witnesses have even claimed that ghostly pirates on the ship will yell out to the fishermen. Legend states that they are trying to capture a creature once believed to inhabit the bay, known only as Champ. In the theater or 'gathering' hall called the Keushk, people have reported cold spots and feelings of unease when alone. People have also claimed that sounds from outside sound muted when in the keushk and that the doors don't stay open. There have been reported sightings of a woman holding a kerosene lamp who walks slowly towards lone walkers between the living units tree houses and windigo. She has been dubbed 'the lady of the lamp' and it is thought that she might be the camp's matron, Madama Farnsworth, or a camper or counselor who died on camp at some time during its history. Room 112 seems to be haunted by a woman who committed suicide there. The electronic key entry system decides when it wants to work, sometimes it will work one minute, and not the next. Inside the room, you will be taken over by an extremely creepy feeling like someone is watching you. Averill Stand Historic Site was built in 1787, and was for many years the stagecoach stop between Bennington and Brattleboro on what is now Route 9. The Averill family managed the stagecoach stand on the site, hence the name Averill Stand, alongside the tavern and Inn. The family cemetery is on a small plot of land adjacent to the old pasture, and contains the bodies of many of the house's former occupants. One of those, Lavina Field Averill, who is believed to have died in childbirth in the home, and it is thought that she may be the spirit who has, on several occasions, placed missing items on the kitchen counter. One visitor reports having seen a young woman in old clothing in the dining room. At night, always between 10:30 and 11:40, the current occupant's dogs run to the back door, barking and watching someone or something, cross the back yard and walk to the old driveway. Some unseen being repeatedly rings the doorbell on snowy nights, leaving no trace of human footsteps. Perhaps it is Lavina, or it could also be Mrs. Brown, the wife of former lumber baron Martin Brown, who lived in the home for many years in the early 1900's, and died there. Mrs. Brown is known to visit at least one of the adjoining houses, in which she also resided. The house is noted for the repeated observations of spirit-sensitive folks for the warmth and friendliness and welcoming feel of the place, which many attribute to the spirits of the house. In the 1960's, five Winooski High School students were killed in a crash coming back from Canada after a suspected night of drinking. The local funeral home didn't have enough room in its parlors to hold all five bodies, so the others were laid out in the school gym. A mass wake was held later held there. Care takers have reported strange sightings since then up to present day when cleaning late at night, especially after sporting events. Ghostly happenings include lights turning on and off, lockers mysteriously opening and slamming shut all down the hall, echoing voices in the gym etc. But perhaps the most frightening of all the things to happen is the sound of wheels rolling along the gym floor and the echoing of the coffins being rolled into the gym for the wake.